I’m a sucker for innovative film making. That is why movies such as Gravity, The ‘Before’ Series, Memento, The Matrix and Inception will continually be among my list of top fascinating movies. Before the year 2013, I had no idea who Richard Linklater was; I hadn’t seen any of his movies, and he had never crossed my radar. The most amazing thing is that after watching all three movies in the ‘Before’ Series last year and being blown away by the awesomeness of them all, I still didn’t know much about him (this can happen sometimes when you are so focused on the movie you forget to check out who made it). 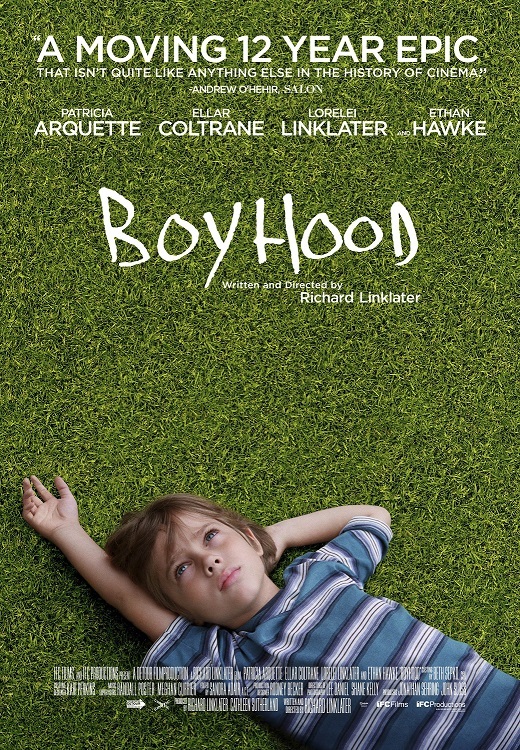 Fast forward to 2014 and the release of Boyhood (If you haven’t heard about it, now you have). The whole movie world is raving about the great feat Richard Linklater has achieved and I’m wondering, ‘who is this guy again?’ (You will have to pardon me. I know I should have known more about him but I didn’t). Anyway back to my narrative….. I find myself intrigued with the stories about Boyhood and how the film was acted at intervals over a twelve year period to achieve its purpose. Let’s dwell on that for a moment….. A director, gathered cast and crew at intervals every year for TWELVE YEARS to make ONE MOVIE! Not a series of movies, ONE SINGLE FILM! If that is not impressive to you, then you have not been to the cinema this year. In an era where Spider man has had a trilogy and a reboot, where movies and sequels are churned out like nobody’s business, where the top movies each year are mostly sequels or prequels or relations to other movies, it seems absolutely absurd that anyone would take that long, OUT OF CHOICE, to make a single movie. Doesn’t he have any ambition? I mean it can take some folks a week to a month to make a movie in these parts (based on word from some sources o! Abeg I repeat, Not my words o! ), so if we do some maths, those folks could have made between 144 and 624 movies while Mr Linklater was busy making one. Yekpaa! Let’s put this into perspective….. It’s not like Mr Linklater wasn’t carrying out other projects or didn’t have any funding. Wikipedia says he had about $200k from the studio every year, which is between ₦28mill to ₦32mill depending on the year in question (this however is minuscule when you carry out some comparison in Hollywood). It’s just that Mr Linklater puts a new meaning to film making with his work based on what I have seen. In the ‘Before’ series, the movies were produced and released at nine year intervals to reflect the time between the events of each film and to provide authenticity; now he has taken it a step further and created a cinematic masterpiece, doing stuff most of his peers would not dare. How can we bring this home to our local cinema? The Filmmaker’s Career Trajectory by pixelmorph sheds some light into the survivalist nature of film making in this country and I for one know how much this can stifle creativity. While it wouldn’t be fair to ask our filmmakers to stop surviving and start creating such great works, I do hope that some of them are holding on to passion projects; hoping to revolutionize the face of film making in Nigeria. 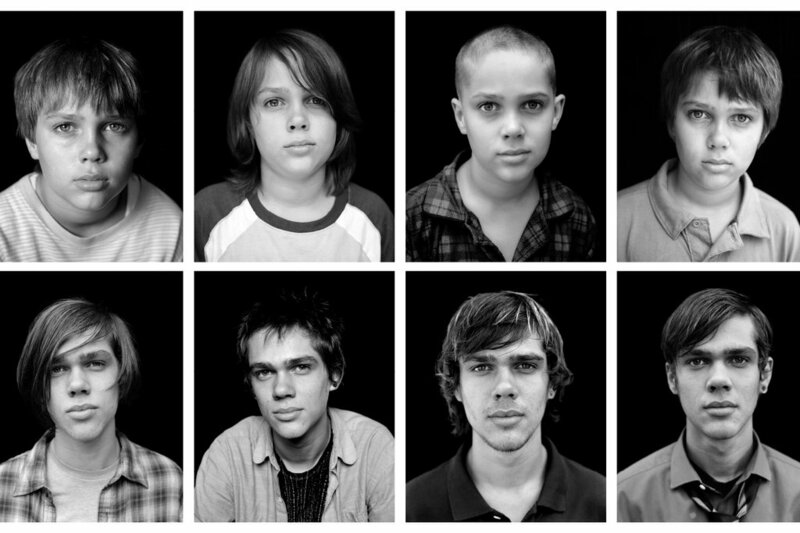 Ellar Coltrane at different ages during the making of boyhood. Note: I am not doing a regular review of this movie because I feel anything I say would pale to the facts above. And while this movie is not a popcorn flick, romantic comedy, or marketing fueled blockbuster that will typically get our current generation to flock to the cinema, it is a treat. Anyone who appreciates the art of storytelling and the power a camera and some film (well now mostly enough memory) can have in bringing awesome stories to the big screen will definitely enjoy this movie. I do hope that Nigerian Cinemas work on getting it onto our screens, because everyone needs that constant dose of awesomeness to remind them that innovative film making is a reality. Kudos to everyone who was a member of the cast and crew on this project. They sure did put together a movie worth watching. Whoa! Now that’s amazing. Thanks for the article, I’ll definitely check it out. Meanwhile, thanks also for showing me how ‘Yekpa’ is spelt! It is an incredible achievement that i doubt will be matched anytime soon, by anyone ,anywhwere. I do hope that in Naija we will get to the point where artistry is as valued in the film world as commerce. Fingers crossed. I’m crossing my fingers with you bro. And even though this genius may not be matched any time soon, it sure makes for good inspiration to those who wanna try something fresh and not just give us the same ole formulaic movies I’m slowly getting tired of.